Deuce Deuce is derived from sulfate of Potash, Pro-biotic Potassium, and Ascophyllum Nodosum. Potassium aids plants in enzymatic function, protein and cellulose formation, efficient photosynthesis, and rapid transportation of carbohydrates and starches throughout a plants vascular system. It will also harden flowers and improve resistance to disease and insects. Microorganisms are suspended in dormancy and become highly active when Deuce Deuce is diluted and mixed in water. The biological life immediately begins breaking down the potassium and over 60 different elements provided by the high quality, cold pressed Ascophyllum Nodosum Seaweed. 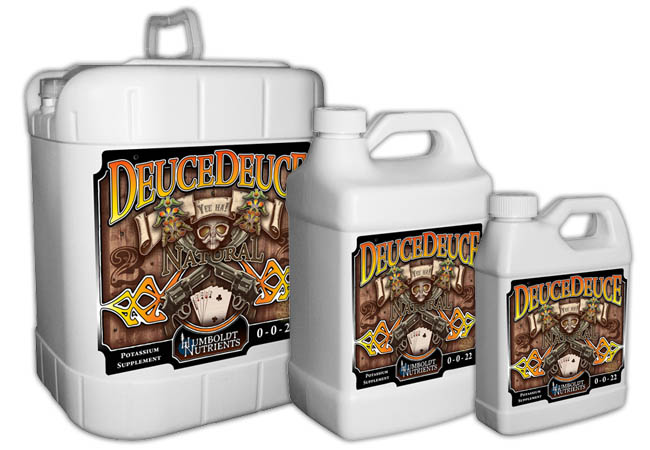 Use Deuce Deuce in conjunction with Grow Natural and Bloom Natural, it will allow your plants to reach their highest level of performance.